Universal Design Living Laboratory (UDLL) may provide hyperlinks or email links to other Web sites maintained by third parties or may provide third party content on our Web site by framing or other methods. The links to third party Web sites are provided for your convenience and information only. These other sites were independently developed by parties other than the UDLL. The UDLL assumes no responsibility for the accuracy or appropriateness of the information contained in such sites. The inclusion of any link to another site on this page does not imply endorsement by the UDLL. The content in any linked Web sites is not under our control so we are not responsible for the content of any linked site or any link contained in a linked site, or any changes or updates to such sites. If you decide to access any of the third party sites linked to our Web site, you do this entirely at your own risk. These other sites may send their own cookies to users, collect data, or solicit personal information. The privacy policies and procedures described here for the UDLL do not apply to any external links. You are encouraged to read the privacy policies of any site you link to from this one, especially if you share any personal information. Selected adaptive equipment products recommended by an occupational therapist are highlighted. An online store to locate products for the home to assist in daily living. Also includes resources on universal design, home assessments, ADA and aging in place. It doesn't have to be complicated or expensive. There are products available for your guests who are Deaf or hard of hearing that are ADA (Americans with Disabilities Act) compliant. The mission of Lifease®, Inc. is to help people live independently and comfortably in their own homes as long as possible by linking seniors and people with disabilities to products and ideas that are applicable to their particular needs and concerns. The CPB/WGBH National Center for Accessible Media (NCAM) is a research and development facility dedicated to the issues of media and information technology for people with disabilities in their homes, schools, workplaces, and communities. NCAM's mission is: to expand access to present and future media for people with disabilities; to explore how existing access technologies may benefit other populations; to represent its constituents in industry, policy and legislative circles; and to provide access to educational and media technologies for special needs students. Information from a company in the United Kingdom regarding choosing and installing stairlifts in homes. The largest network of independent adaptive driving dealers in the United States. This site features the largest selection of accessible vehicles. Contains a wealth of information to keep people from falling, to prevent theft and abuse, and prevent burns and fires. Home safety technology is presented as well as tips to prepare your home for extreme weather. Age-Friendly Innovators is a not-for-profit organization launched by two Certified Aging in Place Specialists. Its purpose is to catalyze thinking about age friendly living and pose creative solutions that enable older adults to live independently in a home of their own. A comprehensive website with articles, publications, videos and blog posts about aging in place and universal design. Aging in Place Options LLC works to bring transformation and education, designing environments that serve the needs of the baby boomer, senior and disabled community. Website includes resources such as the online magazine, "Maturity". A guide which will help to remodel your house and make its design (home, kitchen, lighting, flooring, stairways, rooms etc) more safe and comfortable for seniors. Information for families who want to make the stairs safer for a person with dementia as well as considerations to install and use a stairlift. An article to help people make home modifications to make the home safe as people age in their homes. Useful information is presented to assess the safety in a home. Aging in Place With a Little Help from Roommates, Neighbors and Teenagers. An article about the Golden Girls Network and other programs to assist people to find roommate and get help from neighbors as they age in place. Information on residential elevators, home modifications, safety precautions in the home, and sources of funding for home modifications. The only organization devoted to education and awareness to industry professionals and consumers about making all homes accessible, comfortable, and safe for everyone, regardless of their current or future needs or age. The flagship education is the designation "Certified Living In Place Professional™" (CLIPP™), a program endorsed by the National Kitchen & Bath Association. Many professionals call CLIPP the "How To " for universal design. Graduates include designers, contractors, architects, medical and non-medical care providers, suppliers, real estate and finance experts, home inspectors, and many other related fields. 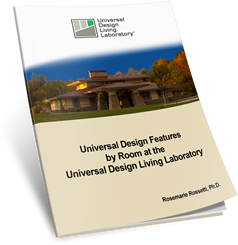 Both Rosemarie Rossetti and Mark Leder are graduates of the CLIPP class and have hosted several classes in the Universal Design Living Laboratory. An article on making plans to stay in your home as you age with services from others to assist in maintaining your home and your health. There are many additional related articles that you can read from this site. We help consumers and professionals make better decisions about products and services for improving, renovating or building a home for active living. Our Sage Tips and robust technology platform support customized choices for home safety, health-related needs and lifestyle goals. A collection of information to evaluate a home for people who are aging in order to accommodate them for increased independence, accessibility and safety. Includes checklists and tools to help make homes a better place to live. Guides, resources, and product reviews to help people as they age. Provides information in an effort to help the disabled and elderly maximize their healthy years and age gracefully. Information is written by a group of medical professionals and is meant to serve as a resource for anyone looking for information on placing themselves or a loved-one into an assisted living or elder care facility. Includes a directory of assisted living centers throughout the United States. Resources include articles, interviews, videos and tutorials about preparing to move into an assisted living facility and dealing with conditions and diseases. AssistedLivingFacilities.org strives to serve as the informational resource for assisted living in the United States. Assisted living has emerged as a popular senior living option for those elderly people seeking a place to reside that offers medical monitoring and minor medical care while still offering personal privacy and freedom. Barbara McVicker, speaker, consultant and author of "Stuck in the Middle: Shared Stories and Tips for Caregiving Your Elderly Parents" offers a lifeline for adult children caregivers in need of educational and emotional support. Her web site provides resources to other web sites of associations and agencies specializing in aging and caregiving for elders. Senior care advisors for families in Wisconsin, Florida and Iowa.They facilitate difficult conversations about care decisions, identify community resources, locate supportive living facilities, and support families who are overwhelmed with caregiver fatigue. This caregivers blog is dedicated to supporting caregivers, family members and friends involved in elder care. There are a range of aging related topics including: dealing with Alzheimer’s, evaluating assisted living options, medical treatment options, elder law and patient’s rights, geriatric resources, caregiver respite and support. Committed to making in-home care accessible to all care seekers. Provides informative articles and resources that can help you understand the options available. Includes a searchable nationwide directory of nearby care providers. This guide was developed in the United Kingdom and contains advice, tips, and ideas to help families decide where a person should live at the time they are in need of caregiving. It contains information on home modifications, sources of funding, and legal considerations. This article addresses safety hazards in the home and recommends products to enhance safety. There are links to other websites with resources to keep seniors safe in their homes. A collection of articles on nutrition, exercise, and mental health to keep people healthy as they age. A resource site focused on technologies to assist in home healthcare. Includes articles, links to products, discussions, market research, white papers, support groups, and a health talk forum. MySeniorCare’s mission is to support families and their aging loved ones as they search for information, resources and providers of senior care. They provide families with a wide range of support and credible information: 500+ articles reviewed by industry experts serving on their advisory board, a member community featuring message boards, user and expert authored blogs and a question and answer section. The Care Provider Directory empowers users to search, compare and directly contact pre-screened providers in their local area. test - home health care - assisted living facilities - hospice Their search tool allows users to search by the specific type of care they require and the payment method they would like to use. Users can also read user reviews of each provider and call toll-free numbers to schedule a free consultation. A free resource for finding local senior homes. Includes comprehensive information on all nursing homes, assisted living, memory care and retirement communities, as well as articles on important senior housing topics to help in care giving. Search for living facilities by cit, state, zip and type of caregiving required. A free referral service for selecting senior housing and in home care service providers. Includes a search function for each state. The nation's largest senior living review site that is searchable by city or zip code. Browse photos, ratings, and opinions of assisted living, dementia care, independent living, senior apartments, and more. You'll also find senior in-home care providers, elder care attorneys, and a community full of advice. Includes senior care housing options from independent living and assisted living to skilled nursing and hospice care. A collection of over 7,000 images of care facilities, over 10,000 links to senior care organizations and thousands of reviews of care services. The site is not sponsored or paid by any service providers and is it free to list a service. Comprehensive advice, guidance, and resources to plan for the care of your child with special needs. Explores the needs of your child based upon the disability and home modifications that will provide safety and accessibility. A wealth of articles and information by Leon A. Frechette on how to build or remodel a home. Includes an online store to purchase home improvement products and tools. His book, Accessible Housing, is a comprehensive look at universal design housing. BobVila.com's newest project, the EnergyWise House, is a stunning 50s-style, multi-level home located in the tony community of Palm Springs, California, home to the stars, celebrities and key personalities of the 1940s, 50s, and 60s. Designed with a focus on energy savings and the environment, this home is a showcase for energy-efficient design ideas, high performance building materials, and environmentally sound products that outperform traditional building products in any building or remodeling project. Research center with videos Building Media's broad array of construction industry clients includes cable media outlets, building product manufacturers, trade associations, consulting companies, publications, trade shows, live events and government agencies. Building Media Inc.'s products and services include TV and multi-media production, distance learning programs, and live events, marketing and consulting. Links to websites with information about home building, marketing, green construction, home improvement, architecture, engineering, construction, materials, and design. A wealth of articles to assist and inspire homeowners to transform and beautify their home. Topics include: design trends, kitchen & bath remodeling ideas, innovative products new to the market, universal design, eco-friendly & energy efficiency remodeling, budget tips, how to choose a remodeler and the like. The site is searchable. A collection of resources, articles and tools to help people who want to build or remodel a home. Information is available on the design process, design software, and how to work with contractors. Information and videos on the process and economics involved with buying a home. An official website of the U.S. Government from the Consumer Financial Protection Bureau to help people research information to obtain a home mortgage and purchase a home. Complete with checklists and tools to help people make smart choices. An article and cost estimates to modify a home to make it more accessible. Includes information to build a ramp, install an elevator or stair lift and remodel a kitchen or bathroom. This guide offers a comprehensive overview of resources and opportunities that can help you overcome the financial challenges that stand between you and home ownership. Whether you’re in the market for a new home or you’re a first-time buyer, this guide has information you need to get past those obstacles. This guide is designed to provide information on many of the available grants to improve your quality of life at home. You will find grants that are intended for all kinds of recipients, whether your disability is one you were born with or the result of a previous medical condition. You will find information on nationwide and state specific programs, as well as suggestions on what modifications may be the most rewarding for you. Plug in the interest rate, down payment, length for the loan, income, debt, taxes and insurance to determine the monthly payment to purchase a home. A guide for those who are disabled and in the process of buying a home. Includes sources for financing, information on how to secure a loan, a checklist to consider when making modifications, and more. A comprehensive site for anyone who wants to own a home, with special information for people with disabilities. Goes through a step by step process of how to shop for a mortgage. Also shows low cost mortgage programs for people with disabilities that qualify. Guide to funding home improvements to enable independent living. Provides interest rates, mortgage information and home loans from thousands of companies. Great for potential home buyers with mortgage questions. A comprehensive web site that includes a mortgage calculator and updated tables with current mortgage rates collected from local lenders and brokers throughout the nation. An information rich resource with rate updates and commentary. Each state is listed to get updates on mortgage rates. Includes a search process for today's lowest home mortgage rates by state and city. Information and creative ideas which help families and caregivers discover the means to care for their elderly loved ones and find the financial resources to assist them. Budgeting advice, ideas to save money and help to make financial goals. When you have a relative with special needs, planning for the future can feel overwhelming and complicated. Make the wrong decision and your family member may lose important benefits. Protected Tomorrows® helps you plan for the future so you and your loved one can live, work and play to the fullest. Here are 12 ways that you can lower the cost of your homeowners insurance. Practical advice to save you money for many years. A guide to build a green home with tips on how to save energy and be eco-friendly. Many reviews of solar energy companies and factors to consider when considering installing solar energy. Holds Green festivals (check web site for dates and locations), Manages the Green Pages (listings require approval), Publishes "Real Money" newsletter, Runs a Green list serve (cabn). Every month people who work in the environmental field meet for a beer (or snack) at informal sessions known as Green Drinks. Gatherings are held worldwide. Check their web site for locations. Net Impact is a global network of leaders who are changing the world through business. A new national organization that provides green companies and non-profits with interactive, state-of-the-art tools and sustainable community resources to improve their businesses and services through cooperation with like-minded organizations. The U.S. Green Building Council (USGBC) is the nation’s foremost coalition of leaders from every sector of the building industry working to promote buildings that are environmentally responsible, profitable and healthy places to live and work. Our more than 7,500 member organizations and our network of 75 regional chapters are united to advance our mission of transforming the building industry to sustainability. Core Purpose The U.S. Green Building Council's core purpose is to transform the way buildings and communities are designed, built and operated, enabling an environmentally and socially responsible, healthy, and prosperous environment that improves the quality of life. Guiding Principles At USGBC, we take how we make our decisions as seriously as the decisions themselves. Our Board of Directors has articulated a set of guiding principles to provide clarity and continuity in our decision making. Tips and information on how to build a healthy and energy efficient home. Law For All. Everybody's Legal Dictionary. Nolo's Shark Talk dictionary contains plain-English definitions for over a thousand legal terms, from the common to the bizarre. Everybody's Legal Glossary Welcome to Nolo's Legal Glossary, your life-raft in the sea of legal jargon. Do you need to know the meaning of sprinkling trust, toxic tort or some equally puzzling legal term? Look it up here. Our glossary contains plain-English definitions for hundreds of legal terms, from the common to the bizarre. Handicap and wheelchair accessible properties for sale and rent. A comprehensive collection of information to help people understand what is involved to buy a home. Find out how much homes have sold for in your neighborhood. Search by location or search by price range. Inman News Features. Lots of Real Estate News. Neighborhood Information by state, city, zip code. A home in Mukiteo, Washington built with universal design features. See photos of this home and learn about features to include in a universal design home. Read articles, books, fact sheets, and guidebooks about livable communities, aging safely at home, age friendly homes, and universal design. Abilities OT Services and Seminars, Inc. Accessibility Design is a design, consultation, project management and product recommendation company that has specialized in home access for seniors and individuals with disabilities for over 15 years. The services carried out by Accessibility Design include but are not limited to, home access site visits, design and consultation, funding research, construction and drafting documents, project management, product recommendation and budgetary assistance. No matter how large the project or how complex your needs are, we can work with you to create the living space that’s best for you. Please give us a call at (952) 925-0301 for more information or visit our website. 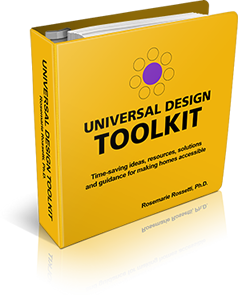 Resources, house plans, companies, articles and books to buy all geared toward Universal Design. Adaptive Environments is a 27 year old educational non-profit organization committed to advancing the role of design in expanding opportunity and enhancing experience for people of all ages and abilities. Adaptive Environments' work balances expertise in legally required accessibility with promotion of best practices in human centered or universal design. Projects vary from local to international. All are characterized by collaboration and user participation. Selected Bibliography for Universal design, aging, ADA, etc. 212-642-4900 The Institute's mission is to enhance both the global competitiveness of U.S. business and the U.S. quality of life by promoting and facilitating voluntary consensus standards and conformity assessment systems, and safeguarding their integrity. Become familiar with ways you can protect your child from accidents in your home. Very informative bulletins on universal design, accessibility features, visitability, home modification, fire safety, house design and floor plans. CAST: Universal Design for LearningCAST is a nonprofit organization that works to expand learning opportunities for all individuals, especially those with disabilities, through the research and development of innovative, technology-based educational resources and strategies. 800-647-6777 The Center for Universal Design is a national research, information, and technical assistance center that evaluates, develops, and promotes universal design in housing, public and commercial facilities, and related products. Located in Ireland, this organization is dedicated to enabling the design of environments that can be accessed, understood and used regardless of age, size and ability. This website has a wealth of information and books about residential universal design that can be downloaded. In support of visitable homes 404-378-7455 Whatever you call it... accessible, universal design, life-time homes, adaptable, visitable... ...this site is about working together for basic access in ALL homes. It's not about access to public buildings...or helping builders create "niche marketing" for disabled or older people...or how to build your own fully accessible house from A to Z (see the "Note" at the bottom of this page if that's what you need). It's not about retrofitting existing homes for a person who's become disabled--important as that is. It's about correcting current building practices, which have disabled people and their allies desperately seeking help to undo existing barriers--while a half-mile down the road a new development is going up constructing exactly those same barriers. Free downloadable brochure with information and checklists to include universal design features in a home: "Easy Access Housing for Easier Living." Free downloadable brochure to create a safer home with fewer accidents: "Accident Prevention: A Safe Home." EasyLiving Homecm is the nation's first voluntary certification program that specifies criteria in everyday construction to add convenience in your new home and to welcome all friends, family and visitors regardless of age, size or physical ability. It sounds so simple, yet these small changes create key lifestyle benefits for homeowners - a home not only easy to live in, but also: Easy to build Easy to visit Easy to sell The EasyLiving Homecm program has been developed by a coalition of public and private organizations to encourage the voluntary inclusion of key features which make a home cost effective, accessible and convenient for everyone without sacrificing style or adding substantial construction costs. EasyLiving Homecm certification enhances both the initial and resale value of a home, and can be achieved for practically any home regardless of price, building site or architecture. The fundamental basis of a European philosophy for accessibility is the recognition, acceptance and fostering - at all levels in society - of the rights of all human beings, including people with activity limitations ..... in an ensured context of high human health, safety, comfort and environmental protection. Accessibility - for all - is an essential attribute of a 'person-centred', sustainable built environment. The European Institute for Design and Disability, EIDD, was founded in Dublin in 1993 with the aim of promoting better design for people with disabilities. The founding philosophy of the Institute has always been embedded in design-for-all, a philosophy which aims to improve the life of everyone through design. ”Good design enables, bad design disables”. That is the motto of the European Design for All declaration also called Stockholm Declaration© adopted on 9 May 2004 in Stockholm. Universal design resources including checklists, resources, and videos. Home Free Home is dedicated to promoting architectural design solutions to enhance the independence and well being of people with disabilities. They recruits volunteer architects and university students to design barrier-free accessible home renovations that allow people with disabilities to live in greater safety and ease. The design services are provided at no cost. This web site, based at the University of Southern California Leonard Davis School of Gerontology, is dedicated to promoting aging in place and independent living for persons of all ages and abilities. It offers training and education opportunities for professionals who wish to respond to the increasing demand for home modification services. It also serves as an information clearinghouse on home modification to equip professionals and consumers with a comprehensive inventory of resources such as a National Directory of Home Modification and Repair Resources. A summary of the Veterans Administration's three main grant programs to assist disabled veterans and servicemembers with necessary home modifications. Lists many recommendations on ways to modify a home to provide more accessibility and safety and funding alternatives to pay for these home modifications. Information about paying for home modifications, accessible home design and how to become your own self-advocate requesting modifications. Includes information on Access Loans and products to use to modify a home for accessibility. Universal design resources are also listed. Read the archives of the emails from around the world as the professionals ask questions and discuss solutions to modifying and building homes with accessibility and universal design. This list is intended to provide communication among the Home Modifications Task Force and anyone else interested in home modifications. Information to be posted here includes announcements of conferences and resource materials. Resources available for determining what modifications need to be made and what needs to be done to get them completed as well as funding sources to help with home modifications. Detailed information on how to install shower grab bars. The IDeA Center practices human centered design through research, development, service, dissemination and educational activities. The primary goal of the Center is to produce knowledge and tools that will increase social participation of groups like people with disabilities and the older generation, who have been marginalized by traditional design practices. Our research activities include systematic reviews, human factors research, usability studies in the field and laboratory, survey research, focus groups and ethnographic studies. 713-520-0232 ILRU, founded in 1975, has a long history of providing research, education and consultation in the areas of independent living, the Americans with Disabilities Act, home and community based services and health issues for people with disabilities. Among our core areas of expertise are: Centers for Independent Living: Long a leader in the area of independent living, ILRU through the IL Net offers training and technical assistance to CILs and SILCs--a listing of centers and SILCs is also updated on a weekly basis Americans with Disabilities Act: The Disability Law Resource Project (DLRP) is one of ten Disability and Business Technical Assistance Centers that provide technical assistance and training on the ADA Home and Community Based Services: Providing support to agencies and providers with training and publications Disability and Health Issues: As collaborators on the RRTC's in Health and Wellness and in Spinal Cord Injury and Exercise, ILRU provides education and training on these important topics ILRU provides training and information dissemination in a number of ways including on-site and on-line training, Web casts and teleconferences. For information on the myriad of projects led by ILRU or to which we lend our expertise, visit our section on projects. For breaking news and useful information, visit What's New or join us on our discussion boards for the latest perspectives on important independent living, home and community based services, health and wellness, and other disability issues. The Independent Living Institute offers resources for persons with extensive disabilities and develops consumer-driven policies for self-determination, self-respect and dignity. We run a virtual library, interactive services, feasibility studies and projects. We are experts in designing and implementing direct payment schemes for users’ self-determination and quality of life in the areas of personal assistance, mainstream taxi and assistive technology. helps Iowans find out about and get the assistive technology (AT) they need as part of their daily lives to learn, work, play, and participate in community life safely and independently. A comprehensive listing of hazards around the yard, garage, and home that could lead to a disaster for a child or an adult. Describes what to look for and how to avoid or eliminate the hazard. Located in New Zealand, Lifemark™ works alongside designers and builders to offer advice on how to make the best use of space in a home, based on the principles of Universal Design. Any new home design and any size home can be Lifemark™ rated. Provides innovative durable medical equipment and high-quality aids for the elderly and disabled. Read the requirements written in September 2008 for the universal design features that are required prior to funding. The National Association of Home Builders has created a web site with universal design resources, product descriptions and manufacturers. Documents include: aging-in-place checklists, accessibility laws and regulations, the Fair Housing Act Design Manual, and frequently asked questions and answers about building. There are many additional web links to learn more about universal design. The NAHB 50+ Housing Council is the voice of the 50+ seniors housing industry and a leading source of information and research on the active adult, independent living, service-enriched, and assisted-living markets. Membership gives you access to these valuable resources and offers opportunities to network with others in the industry, including experts. Browse the resources below for key council contacts, the council’s mission and goals, or sign up for membership. A Universal Design Certified Professional goes through extensive training on how to interview clients with an understanding and consideration of their special needs and how to incorporate universal design into remodeling projects. You can find a Universal Design Certified Professional in your area on this link. 908-843-6522 The National Kitchen and Bath Association is a growing non-profit trade association with over 25,000 members. We’ve led the kitchen and bath industry for over forty years by providing resources for consumers and industry professionals. Not only does NKBA host the world’s largest trade show and offer educational programs, but we also enhance the success of our members by promoting professionalism and ethical business practices. In order to benefit consumers, our association monitors national and state legislation to protect the industry, our members, and consumers. Andrus Gerontology Center, University of Southern California 213-740-1364 Our vision is to create a Center of excellence to ensure the independence, safety, and well being of older persons through fall prevention. Our mission is to provide leadership, create new knowledge, and develop sustainable programs for seniors and their families, professionals, program administrators, and policy makers. A checklist created in 2007 of universal design features to guide builders and architects during the design and building process. California law, section 17959.6 of the Health and Safety Code, requires a builder of new for-sale residential units to provide buyers with a list of specific “universal design features” which make a home safer and easier to use for persons who are aging or frail, or who have certain temporary or permanent activity limitations or disabilities. The ProMatura Group is a market and consumer research company that has successfully bridged the gap between businesses and 50+ adults, solid scientific research and the real world. 703-524-6686 We are an interdisciplinary association of people with a common interest in technology and disability. Our purpose is to improve the potential of people with disabilities to achieve their goals through the use of technology. We serve that purpose by promoting research, development, education, advocacy and provision of technology; and by supporting the people engaged in these activities. The Rehabilitation Engineering Research Center on Technology for Successful Aging (RERC-Tech-Aging), a University of Florida (UF) initiative, was established in October, 2001. The primary focus of the Center is to promote independence and quality of life for older people with disabilities through technology - devices that can make everyday tasks easier to complete. This RERC-Tech-Aging, funded by the National Institute on Disability and Rehabilitation Research (NIDRR), builds on the work of Mann and colleagues, who in 1991 established and conducted work as the NIDRR funded RERC-Aging at the University at Buffalo (State University of New York at Buffalo). The Ronald L. Mace Universal Design Institute is a non-profit organization based in North Carolina dedicated to promoting the concept and practice of accessible and universal design. A home checklist to enhance safety in the home. An assessment tool to determine the universal design and safety features that are present in a home. This article explores steps to take to make a home safer for seniors as well as products to enhance safety. There are many links to other resources on home safety. A national non-profit organization and resource center for education, technology, and funding alternatives for seniors and people of all ages with disabilities. Includes checklists, articles and information on livable and universal design homes. Simplified Disabled Housing is an individualized access housing system to be utilized by new home developers. SDH allows developers to build homes in mass production around a single person's accessibility needs. SDH makes a home what it should be - an affordable sanctuary that adapts to you instead of you adapting to it. Specialized Home Design, Inc. offers proven solutions that address unique living environment needs. They specialize in enlightening professionals and non-professionals about universal and accessible home design. Scott Anderle, PT, CAPS has extensive experience as a physical therapist and a home modification specialist and brings compassion and commitment to each task. He is recognized as a national speaker and is a renowned expert in the arena of universal and accessible home design. The company mission is to provide information about universal and accessible home design through our website, the CHER (Comprehensive Home Evaluation Report, a web-based reporting tool and resource for information), our educational seminars and professional consulting. This is the official website of the Fall Prevention Center of Excellence. Our mission is to identify best practices in fall prevention and to help communities offer fall prevention programs to older people who are at risk of falling. This web site is a window into a world of possibilities for people who are searching for products, services, information and reassurance that will help them, and in some cases, their aging parents, live confidently at home for as long as possible. TeleHome Companion is dedicated to helping people better age-in-place by showing the benefits of using universally designed housing & products, telecare technologies, and other assistive products that are moving from the drawing board to the market, which can make life easier at home. Includes a variety of ways to save money and get financial assistance to modify homes. 800-872-2253; 800-993-2822 TTY A federal agency committed to accessible design. A comprehensive checklist for universal design and green building features, as well as resources. Created by the University of Iowa Legal Clinic. A comprehensive resource site to learn more about what is universal design as well as visitability. There are many links to product manufacturer's web sites to source solutions to adapt or build a new home with universal design features. Included are PowerPoint presentations and research studies. There are also links to laws and regulations regarding ADA and Fair Housing codes. The Universal Design Educator's Monthly Online News grew out of the Fourth Universal Design Educator's Project Forum held as part of Designing for the 21st Century Conference in June of 1998. This site is packed with articles about universal design and resources. There are also links to universal design sites. An information web site promoting universal design. It includes an extensive tips booklet that serves as a checklist for those who want to incorporate universal design when they build or remodel. This site also lists suppliers and manufacturers of products that can be incorporated in a home, with links to their web sites. The collection of essays serve as a primer on the subject of universal design. There are various links to professional organizations and experts in the field including architects, interior designers, builders and remodelers. Improving People’s Lives By Design UD&C facility assessments for accessibility typically include a review of available diagramatic plans, a walk-through and an on site brief with staff regarding the findings and expectations for the content of the resultant Facility Survey Report. UD&C has developed self-survey analysis systems for use by client staff and contractors. These systems often address dimensional tolerances and alternative solutions and can be applied to various building types. When accompanied by UD&C prepared self-survey forms and staff training, this facility assessment approach can be extremely cost effective for clients with large numbers of similar facilities. Includes a business directory that helps homeowners find professionals to assist with universal design projects. Many checklists to help people include universal design features in homes. In an effort to assist in research and development in the field of Universal Design, the Center for Inclusive Design and Environmental Access (IDEA) and the Rehabilitation Engineering Research Center on Universal Design at Buffalo (R.E.R.C. on Universal Design) provides links to many sites that offer beneficial concepts, information, or innovations. These links are intended to be as comprehensive as possible in offering the very best in Universal Design. DO-IT promotes the use of universal design principles to create a more accessible and usable world. DO-IT is funded by the U.S. Department of Education and the National Science Foundation to share guidance and resources on creating more accessible products and environments through the use of universal design. DO-IT's special focus is on the accessible design of information technology and universal design in education (UDE). The following DO-IT publications and videos apply universal design principles to a wide variety of products and environments; Including instruction, websites, distance learning courses, software, multimedia, libraries, computer labs, career centers, advising offices, tutoring and learning centers, and conference exhibits. Many of them provide checklists for implementation of universal design in a specific application area; developed with formative input from the field and tested nationwide, in put to further refine these products is welcome from practitioners. 2301 Argonne Dr, Baltimore, MD 21218 Phone: 410-554-9134 V-LINC creates technological solutions to improve the independence and quality of life for individuals of all ages with disabilities in Maryland. We do this through a mix of off-the-shelf computer software and equipment, and one-of-a-kind, customized assistive technology. AARP Public Policy Institute "Increasing Home Access: Designing for Visitability"
A comprehensive report looking at the visitability movement in the United States, including laws passed and the cost of visitability features in new homes. There is an extensive discussion about the rationale of visitablity, as well as interviews with builders who are including these features. Contains a collection of publications about visitability, including tutorials. State and local visitability laws are also included. Information about the Visitability Listserv. A primary source of information about the visitability movement in the United States that was initiated by the founder of Concrete Change, Eleanor Smith. Formally known as Adaptive Environments, this international non-profit organization, based in Boston, is committed to advancing the role of design in expanding opportunity and enhancing experience for people of all ages and abilities. It promotes best practices in human-centered or universal design. Contains information on the seven principles of universal design, as well as publications illustrating how to build a step free entrance. In late 2006, a group of advocates, stakeholders, state staff, and City of Columbus officials, came together to discuss the idea of proposing a visitability initiative for the State of Ohio. Since that first meeting they have worked at ways to implement a statewide visitability regulation for all newly constructed homes. This site includes resources about visitability. Information on the visitability movement in the United States. Includes resources and articles published across the country. A comprehensive illustrated booklet on the visitability features to include in new housing. Includes a brief history, cost analysis and practical guidelines for integrating these features. Ideas and tips to modify a home to improve safety. A look at the various areas inside and outside a home for safety considerations. Also, advice for people who use wheelchairs for wheelchair maintenance and safety while in a wheelchair. AARP is a nonprofit, nonpartisan membership organization for people age 50 and over. AARP is dedicated to enhancing quality of life for all as we age. We lead positive social change and deliver value to members through information, advocacy and service. AARP also provides a wide range of unique benefits, special products, and services for our members. A Center for Independent Living in Berks County, located in Reading, PA that provides: Information and Referral, Peer Counseling, Independent Living Skills Training, Service Coordination, and System Advocacy Change. Other programs include: Americans with Disabilities Act(ADA) Civil Rights trainings, conducts accessibility surveys, examines building code compliances, and coordinates mediation services. A nonprofit organization that was established to enhance the quality of life for people with disabilities through housing, education, employment, media and volunteer opportunities. The ABILITY House project is a partnership with Habitat for Humanity affiliates. Each ABILITY House is an accessible home built for a family where one or more members have health conditions or disabilities. ABILITY Magazine is the leading magazine covering Health, Disability and Human Potential. AM is an award-winning publication, distributed by Time-Warner. For nearly 20 years, the mission of the magazine has been to provide new insights into our individual levels of ability. From Diabetes to Spinal Cord Injury, from celebrity interviews to CEO profiles, ABILITY covers the latest on Health, Environmental Protection, Assistive Technology, Employment, Sports, Travel, Universal Design, Mental Health and much more. AgeWiseLiving helps family members help their aging loved ones resolve their eldercare issues by choice, not crisis. Go to the web site for more information about Generational Coaching, The Ultimate Caregiver’s Survival Guide, and lots more. Discover the myths and realities of aging. Learn about the power of universal design to maximize health, quality of life and longevity. Learn to accommodate the needs of your older employees, family members, and customers. Look at choices in housing which guarantee that you will "age in place" and never be moved along a continuum to independent, assisted, or skilled care. The Alzheimer’s Association, the world leader in Alzheimer research and support, is the first and largest voluntary health organization dedicated to finding prevention methods, treatments and an eventual cure for Alzheimer’s. For 25 years, the donor-supported, not-for-profit Alzheimer’s Association has provided reliable information and care consultation; created supportive services for families; increased funding for dementia research; and influenced public policy changes. Our mission To eliminate Alzheimer's disease through the advancement of research; to provide and enhance care and support for all affected; and to reduce the risk of dementia through the promotion of brain health. 800-AHA-USA-1 The American Heart Association is a national voluntary health agency whose mission is to reduce disability and death from cardiovascular diseases and stroke. The mission statement was affirmed by the Delegate Assembly at its meetings of June 1993, June 1996 and June 1999. The mission statement undergoes a formal review process every third year. The American Occupational Therapy Association (AOTA) is the nationally recognized professional association of approximately 35,000 occupational therapists, occupational therapy assistants, and students of occupational therapy. Practitioners work with people experiencing health problems such as stroke, spinal cord injuries, cancer, congenital conditions, developmental problems, and mental illness. Occupational therapy helps people regain, develop, and build skills that are essential for independent functioning, health, and well-being. 888-4-STROKE 2010 Goal The American Stroke Association’s goal is to reduce stroke and risk by 25 percent by 2010 Vision Statement We envision a world where stroke is minimized and ultimately eliminated as a major health problem. We look forward to a world where risk factors are reduced and rapid treatment is obtained. We strive to change the landscape of healthcare delivery so that optimal care and maximum recovery are achieved for those who do suffer a stroke. 888-AMP-KNOW The Amputee Coalition of America (ACA) is a national, non-profit amputee consumer educational organization representing people who have experienced amputation or are born with limb differences. The ACA includes individual amputees, amputee education and support groups for amputees, professionals, family members and friends of amputees, amputation or limb loss related agencies, and organizations. To pool together a wealth of information, insights, opinions, ideas and expertise on a wide range of issues regarding and relating to disability. A comprehensive information center for people with disabilities especially those with spinal cord injuries. The resources section includes links to organizations and web sites. Information is provided for housing, home accessibility and home modification. See information regarding technology that is helping people with disabilities. 888-CEC-SPED The Council for Exceptional Children (CEC) is the largest international professional organization dedicated to improving educational outcomes for individuals with exceptionalities, students with disabilities, and/or the gifted. CEC advocates for appropriate governmental policies, sets professional standards, provides continual professional development, advocates for newly and historically underserved individuals with exceptionalities, and helps professionals obtain conditions and resources necessary for effective professional practice. 800-344-4823 The mission of the Cystic Fibrosis Foundation--a donor-supported, nonprofit organization--is to assure the development of the means to cure and control cystic fibrosis (CF) and to improve the quality of life for those with the disease. 202-986-0375 Founded in 1979 by people with disabilities and parents of children with disabilities, the Disability Rights Education and Defense Fund, Inc. (DREDF) is a national law and policy center dedicated to protecting and advancing the civil rights of people with disabilities through legislation, litigation, advocacy, technical assistance, and education and training of attorneys, advocates, persons with disabilities, and parents of children with disabilities. A broad range of resources about transportation-related issues to help people with disabilities. 202-554-3501 Support organisation for veterans, providing a nationwide network of services, free of charge to all veterans and members of their families. A guide from the American Red Cross to help people who have physical, visual, auditory, or cognitive disabilities to prepare for natural disasters and their consequences. 312-726-6200 Easter Seals has been helping individuals with disabilities and special needs, and their families, live better lives for more than 80 years. From child development centers to physical rehabilitation and job training for people with disabilities, Easter Seals offers a variety of services to help people with disabilities address life's challenges and achieve personal goals. 800-677-1116 HomeAboutThe Aging NetworkResourcesAbout: Menu About The Service About The Database Users Guide The Media Center Contact InformationNetwork :: Menu Administration on Aging State Units on Aging Area Agencies on Aging Services AvailableResources :: Menu Glossary Fact Sheets Assessment Tools Federal Resources Helpful Links Caregiver Resources Eldercare Search February 20, 2006 Welcome to the Eldercare Locator, a public service of the U.S. Administration on Aging. The Eldercare Locator connects older Americans and their caregivers with sources of information on senior services. The service links those who need assistance with state and local area agencies on aging and community-based organizations that serve older adults and their caregivers. A media outlet that contains videos and interviews by and for people with disabilities that are about issues they are facing. Also includes an online community for anyone to join. Information on fire safety especially aimed at people with physical and/or cognitive disabilities. Information to protect your home from a fire. A resource guide created specifically for people with disabilities, with recommendations on how to prevent, prepare and recover from a fire. Fire is a really dangerous thing, and more than 3,400 people die because of fires every single year in the United States. At the same time, more than 16,000 people are injured due to fire breaking out. Those with disabilities are especially vulnerable when it comes to fires breaking out, as they may not be able to escape as easily as everyone else. A person with a physical disability might have a tougher time actually escaping due to possible obstacles being in the way or the design of the building not accommodating an easy escape for those in a wheelchair. However, there are a lot of different things you can do in order to improve your chances of making it out when there's a fire, although it is obviously best to try and avoid fires breaking out in the first place with the right fire prevention techniques. SplitLevel has published an infographic that helps those with disabilities stay safe in case of a fire. Using this guide, you will not only be able to help prevent fire, you will also become more aware of what to do in case you know a person who has a disability of some sort. Resources, tools and technology to helps students with visual impairments. Information to help create a pre-move checklist and get better organized and packed in order to move out of a residence. Staff working for Helping Hands Initiative Incorporated will travel within the New York City Area to help individuals obtain services needed to gain independence. Helping Hands Initiative Incorporated’s advisory service will help individuals prepare applications that will help them become as independent as possible in society. Individuals will be assisted with applications such as insurance, Social Security Benefits and hospital applications. Assistance with obtaining mobility devices such as wheelchairs and walkers will also be provided. Follow-ups with both the clients and individual organizations will be completed to be sure satisfaction is achieved. Learn about the steps you can take to keep your family and pets safe in the event of a fire. Tips are included for adults, youth, teens, seniors and people with disabilities. A website with average national costs for home inspection and appraisals. When buying or selling a home you may need to enlist the services of an inspector and/or an appraiser to help assess the value of your home and to see if your home is in need of any work. The IDEA Center sponsors a discussion list to maintain communication and dialog among those interested in home modifications. Advice for dentists, patients with Alzheimer's Disease, and their caretakers to improve oral health. Contains a wealth of information regarding the federal laws and building codes related to accessible buildings and homes. JobAccess is the first and largest employment website for job seekers with disabilities. Since 1995, JobAccess has provided a place where people with disabilities can seek employment, confident they will be evaluated solely on their skills and experience. Posting resumes or searching job postings are free. Resumes are anonymous until the job seeker allows the employer to contact them. 800-829-0500; 212-821-9713 TTY Worldwide organization dedicated to overcoming vision impairment through rehabilitation, education, research and advocacy. An online resource for those who have mesothelioma and those looking to learn more about it. A resource to help mesothelioma patients and their families obtain compensation from asbestos trust funds. Information about mesothelioma, care options, and health solutions. Help in finding a Mesothelioma lawyer in your area. Access to information, support and treatment advice for patients with mesothelioma. Information to bring awareness to mesothelioma, a cancer that has been found in many veterans. Learn about the disease, the stages, the treatments, and benefits that veterans can receive for treatments. Contains information on the symptoms and treatment of Mesothelioma and directs visitors to resources to help with their treatment. 800-572-1717 The Muscular Dystrophy Association is a voluntary health agency — a dedicated partnership between scientists and concerned citizens aimed at conquering neuromuscular diseases that affect more than a million Americans. MDA combats neuromuscular diseases through programs of worldwide research, comprehensive medical and community services, and far-reaching professional and public health education. Tips to learn more about airline travel for people with disabilities. 301-587-1788; 301-587-1789 TTY The mission of the National Association of the Deaf is to promote, protect, and preserve the rights and quality of life of deaf and hard of hearing individuals in the United States of America. 703-525-3406; 703-525-4153 TYY As a membership organization, NCIL advances independent living and the rights of people with disabilities through consumer-driven advocacy. NCIL envisions a world in which people with disabilities are valued equally and participate fully. 301-496-1752 NIA, one of the 27 Institutes and Centers of NIH, leads a broad scientific effort to understand the nature of aging and to extend the healthy, active years of life. In 1974, Congress granted authority to form NIA to provide leadership in aging research, training, health information dissemination, and other programs relevant to aging and older people. Subsequent amendments to this legislation designated the NIA as the primary Federal agency on Alzheimer’s disease research. National Institute of Health 301-496-0252 The National Institute on Deafness and Other Communication Disorders (NIDCD) is one of the Institutes that comprise the National Institutes of Health (NIH). NIH is the Federal government's focal point for the support of biomedical research. NIH's mission is to uncover new knowledge that will lead to better health for everyone. Simply described, the goal of NIH research is to acquire new knowledge to help prevent, detect, diagnose, and treat disease and disability. NIH is part of the U.S. Department of Health and Human Services. Established in 1988, NIDCD is mandated to conduct and support biomedical and behavioral research and research training in the normal and disordered processes of hearing, balance, smell, taste, voice, speech, and language. The Institute also conducts and supports research and research training related to disease prevention and health promotion; addresses special biomedical and behavioral problems associated with people who have communication impairments or disorders; and supports efforts to create devices which substitute for lost and impaired sensory and communication function. US Department of Education 202-205-8134; 202-205-4475 TYY The National Institute on Disability and Rehabilitation Research (NIDRR) provides leadership and support for a comprehensive program of research related to the rehabilitation of individuals with disabilities. All of our programmatic efforts are aimed at improving the lives of individuals with disabilities from birth through adulthood. 800-346-2742 Our gateway to an abundance of disability- and rehabilitation-oriented information organized in a variety of formats designed to make it easy for users to find and use. For the past 25 years NARIC staff members have been dedicated to providing direct, personal, and high-quality information services to anyone throughout the country. As a leader in providing interactive information to the disability and rehabilitation community, NARIC's Web site continues this tradition by putting the information into the hands of the users through online publications, searchable databases, and timely reference and referral data. The Ohio Injury Prevention Partnership is a statewide group of professionals representing a broad range of agencies and organizations concerned with the prevention of injury. The group is committed to strengthening and sustaining effective injury and violence prevention programs and policies in Ohio. 800-424-8200 The Paralyzed Veterans of America, a congressionally chartered veterans service organization founded in 1946, has developed a unique expertise on a wide variety of issues involving the special needs of our members— veterans of the armed forces who have experienced spinal cord injury or dysfunction. Information to help you plan for an emergency or disaster where you live or in your community. The ProMatura Group is a market and consumer research company that has successfully bridged the gap between businesses and 50+ adults, solid scientific research and the real world. The ProMatura Group excels at blending the domains of business, science and practice, and was founded on the premise that applicable, empirical research must provide usable and useful knowledge for creating products, services and environments that entice the 50+ populace. 800-949-4232 Find your local ADA The ADA Technical Assistance Program has been in existence since 1991, shortly after the passage of the Americans with Disabilities Act. Since its inception, the Program has consisted of a diverse array of projects to further the understanding and implementation of the Act. The program has created a vast infrastructure of resources, including numerous ADA publications and videos, materials targeted to specific audiences, training packages and an unparalleled knowledge of the ADA. Many resources exist here online to provide support, tips, and further information about blindness for those who are blind or visually impaired. A collection of links to websites that offer assistance, savings and connections to resources for people with disabilities. The focus is on accessible housing, transportation, energy savings, assistive technology, taxes, legal advice, education, healthcare, and more. RetirementRevised.com is the companion website of Retire Smart, a column written by Mark Miller that appears in newspapers around the U.S. each week. For millions of Baby Boomers, retirement is an opportunity for reinvention, rather than taking it easy. Mark is helping write the playbook for the new career and personal pursuits of a generation. This website contains health resources on rheumatoid arthritis. Get many tips on creating a safer home, room by room and see links to other resources on home safety. Simply Living of Central Ohio supports individuals, families and organizations in creating a more compassionate and sustainable world by offering learning opportunities which promote personal and civic responsibility, informed action and wholeness. Dr. Skipp DeGraff’s mission for Skip's List is to provide a world-class, user-friendly, apolitical, and free information exchange that serves all people with disabilities as well as their families and friends. On this web site you can review the day’s news, find accessible housing, create a blog, find romance from personals, volunteer for research studies, reconnect with rehab alumni, consult a long list of Web resources, benefit from consumer-to-consumer commerce, and join discussion/support groups with a worldwide scope. Anyone whose field of vision falls at or below 20 degrees, who wears corrective glasses but whose vision is 20/200 or less in his best eye, or who has no eyesight at all, meets the legal definition of being blind and is eligible for certain tax deductions. A large collection of tips and resources to find homes for people with disabilities. Includes suggestions to retrofit, modify, and find financial support. Locate Area Agencies on Aging - find local agencies The AoA Strategic Action Plan for 2003-2008 was developed at the direction of the Assistant Secretary for Aging to guide the Administration on Aging as it carries out its statutory mission and provides national leadership on aging issues. The Plan establishes five strategic priorities and related goals and objectives that will be used to focus AoA’s investment of effort and resources over the next five years. The plan is framed by the priorities established by the Assistant Secretary for Aging and supports the HHS Strategic Plan for 2003-2008. U.S. Dept. of Housing and Urban Dev. 800-827-5005 Publications Center: 800-767-7468 The Office of Fair Housing and Equal Opportunity administers federal laws and establishes national policies that make sure all Americans have equal access to the housing of their choice. Particular activities carried out by the Office of Fair Housing and Equal Opportunity include implementing and enforcing the Fair Housing Act and other civil rights laws, including Title VI of the Civil Rights Act of 1964, Section 109 of the Housing and Community Development Act of 1974, Section 504 of the Rehabilitation Act of 1973, Title II of the Americans with Disabilities Act of 1990, the Age Discrimination Act of 1975, Title IX of the Education Amendments Act of 1972, and the Architectural Barriers Act of 1968. Several suggestions for home adaptations for people with disabilities.